The Institute of Contemporary Music Performance (ICMP) and Shure are delighted to announce the launch of the 2010 Shure Songwriting Award. Previously known as the Shure Creative Award and supported by Amy McDonald and K.T. Tunstall, the competition will be judged this year by the sensational singer/songwriter, Paloma Faith. Paloma has taken the music world by storm this year releasing her debut album “Do You Want the Truth or Something Beautiful?” With the release of her first single ‘Stone Cold Sober’ being brought forward a month early after UK radio leapt on it with such enthusiasm, she is proving herself to be a major new star! So, if you are a singer/songwriter looking to emulate Paloma and make a career out of your talent, why not take part in this year’s award competition? First prize is a unique opportunity to attend, free of charge, the fantastic one-year Professional Diploma in Songwriting course at the ICMP, Europe’s leading school of modern music, worth over £5,000! And in addition, two runners up will win some amazing Shure gear. Studying at the ICMP, you will be able to take part in regular live showcase events, professionally develop your talent and have direct access to leading industry professionals. The winner of last year’s award, Zemmy, has already played and performed at a range of high-profile London venues and has supported talented singer/songwriter Amy Studt on part of her UK tour. Make Music New York invites composers to submit entries for this year’s “musical handshake”. The Event: Make Music NY is a unique, free outdoor celebration called “the largest music event ever to grace Gotham” (Metro New York). As part of the third annual festival, a new addition called “Mass Appeal” brings together hundreds of musicians forming ensembles of one type of instrument, including clarinets, french horns, ukuleles, hub caps, violas, accordions, saxophones, and more, that anyone can join in on. The Open Call: MMNY is now accepting submissions for “musical handshakes” — a single melody serving as the secret lingua franca for Mass Appeal musicians on Sunday June 21st, 2009. These musicians will use the winning “musical handshake” to greet one another throughout the day, beyond bands of instruments, with the hope that momentary handshakes will turn into longer, improvised musical conversations. In the evening, the composition will receive its public premiere at the “Mass Appeal” afterparty in Central Park. The winning musical handshake will be selected by a panel of distinguished judges (including Bill Bragin of Lincoln Center and Jeanette Sarkisian Wagner of NY City Center), and announced in late May, giving one composer the honor of a Mass Appeal premiere on June 21st. • A musical handshake is a short melody, up to 10 seconds long, consisting of two phrases, so that two musicians can use it to greet each other with a call and response. • Nearly all instruments and all musicians – from amateurs to professionals – should be able to play the musical handshake. 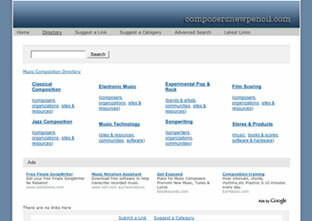 • No more than two submissions per composer will be accepted. • Entries are due by midnight on Friday May 1st, 2009. • Entries must be submitted in standard musical notation. • Participants must be residents of the New York City area and in attendance on June 21st. • By submitting a musical handshake, you affirm that the composition is your own, and agree that, if selected, your submission will become the property of Make Music New York, Inc.
For further information about the Musical Handshake or about Mass Appeal, please contact Elizabeth Ferguson, Mass Appeal Coordinator, at eferguson@makemusicny.org or at (510) 316-3061. 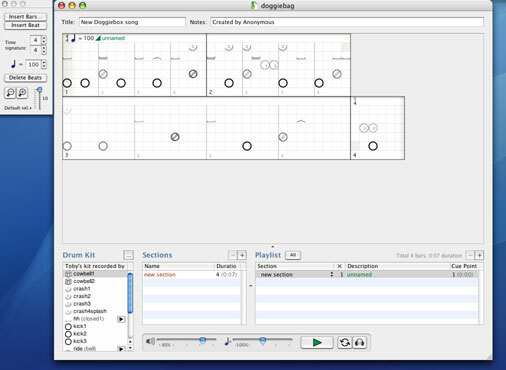 Doggiebox is a drum machine application for Mac OS X that lets you create and manipulate percussion-based songs. What I really like about it is that all sounds are fully customizable. This means that you can create or record your own kits. For example, you can record your friend’s drumset (or your own if you have one) and create a kit with each of those sounds in Doggiebox. You can even create kits of “non-instrument” sounds (for example kits created with your voice, your kitchen pots, etc.). 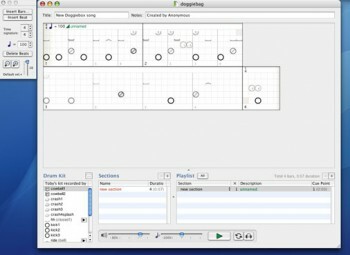 There are three things that make Doggiebox to me a very successful drum machine application. One (in no particular order), it’s only $39 dollars. Two, its ease of use. I was able to create a simple beat after minutes of installation. And three, you can create drum parts that sound pretty real. Doggiebox is a MAC only application. Songs of unlimited length can be edited in any number of tempos and time signatures. When you feel the drum part is ready, you can export it to one of a dozen file formats including AIFF and WAV, for use in other audio programs, or play back in realtime to a MIDI device. I’ve had Doggiebox for a week, so I’m sure I’m missing other features (so feel free to comment about your experience with it, good or bad). I still believe there is nothing like having a good drummer available to record your songs. Unfortunately and for various reasons, this is not always possible. Feed your Doggiebox when you can’t get one. (I called that one “Doggie Bag”, a short beat I created with Doggiebox so you can get an idea of what you can do. I used GarageBand afterwards to add a little reverb and a bit of echo).